Project Management Institute (PMI®) has updated its Continuing Certification Requirements (CCR) program (certification renewal requirements) to align with the new PMI Talent Triangle™. In this post, we’ll review how the new requirements have changed vis-à-vis the previous, and how PMI-certification holders can ‘transition’ from the old program to the new. If you have certified recently, you can also learn about the updated CCR program through this post. What is PMI Talent Triangle? Through research, PMI has established that project management practitioners require not only technical skills, but also leadership and business intelligence skills to support strategic objectives that contribute to their success. 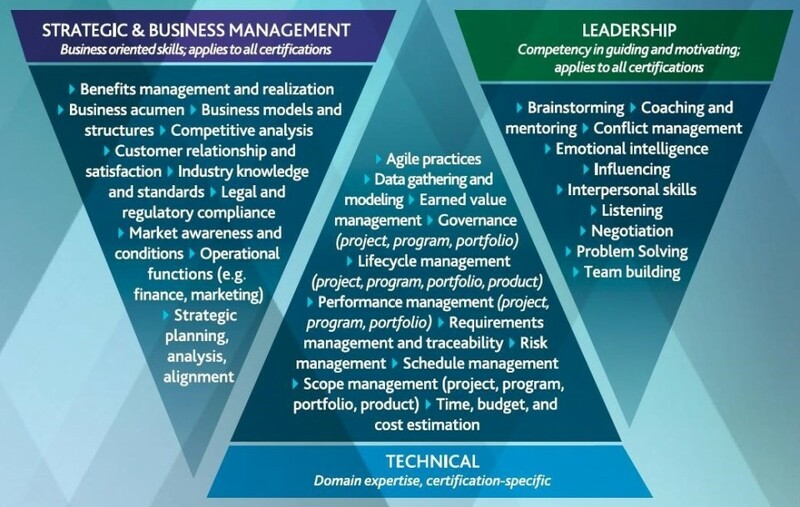 This combination of technical, leadership, and strategic and business management competency is what is now termed as the PMI Talent Triangle. Leadership: Knowledge, skills and behaviors specific to leadership-oriented, cross-cutting activities that help an organization achieve its business goals. How has the CCR Program changed? With effect from Dec 1, 2015, PMI’s CCR program has been updated to align with the PMI Talent Triangle. In January 2016, PMI also updated the PMP® exam on the same lines and emphasized on benefits realization, delegation techniques, business acumen, emotional intelligence, generational sensitivity and diversity, customer satisfaction, etc. The good news for those with certification renewal due date before Dec 1, 2017 is that you can still follow the requirements of the old program for your current renewal cycle. Personally for me, this is relief because my PMP certification renewal is due on Nov 27, 2017. Talk about a close shave! I do not need to worry about the new requirements for this cycle. However, while reporting the PDUs now, you still need to categorize your PDUs as per the new talent triangle regardless of when your renewal is due. The image below shows the part of PDU Reporting form used for categorizing the PDUs per the talent triangle. Is the new CCR program more difficult? The next question that comes to mind is whether the new CCR program is more difficult compared to the previous one. I spent some time to research this. In my opinion, the answer is ‘no’. Overall, I like the new program more. While certain changes have made it more difficult to meet the re-certification requirements, the new program has simplified matters in general. Let’s deep dive into the details. The total number of PDUs required to maintain your certification has not changed. For PMP, the total PDUs required remains at 60 PDUs per cycle (3 years). The PDU categories have changed. This is a positive change because I always found the previous categories (A-H) and their rules, unnecessarily complicated. The new structure is much simplified. 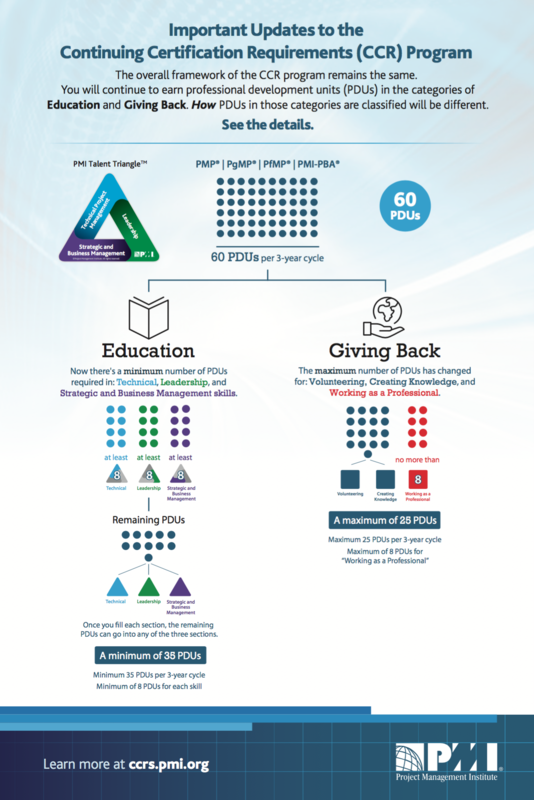 Now we have just 2 categories of PDUs at the top level - Education and Giving back to the profession. Each of these sub-categories has a minimum requirement of 8 PDUs per cycle (3 years). This is what makes the new requirements challenging. Previously, there were no category-specific ‘minimum’ PDU requirements. Now you have to know specifically which sub-category the PDU belongs to and ensure that you meet the minimum requirements in each sub-category. Moreover, most of the free PDU resources on the web provide PDUs for the first 2 categories, and not for the Strategic and Business Management category. But not too fret. In another post, I’ll share the free sources to get at least 8 PDUs in each category. So you are covered. The good part is that there’s no minimum for self-directed learning (or for any of the above means for that matter). You can potentially earn all 60 PDUs through reading books (but remember to take notes while you read, and keep them as supporting evidence in case you get audited). Previously, working as a project management professional could fetch you up to 5 PDUs per year or 15 PDUs per cycle for PMP. Now this has been reduced to just 8 PDUs per cycle for PMP. This will make you work harder to get your 60 PDUs. Here’s my quick plan to claim 60 PDUs going forward, without spending any money. It doesn’t appear too hard, does it? In a future post, I’ll detail out the plan to earn 60 PDUs and also share links to various sources of free PDUs that follow the new PMI Talent Triangle structure. If you found this post useful or have any questions, please comment below and let me know.